Birdsall-Dreiss lecturer Dr Bridget Scanlon has called for changes to agriculture in semi-arid regions like to preserve our scarce water resources and make primary production more sustainable. Dr Scanlon – the Senior Research Scientist in the Bureau of Economic Geology at the Jackson School of Geosciences, attached to the University of Texas in Austin – has set five priorities to improve the sustainability of semi-arid farming. She points out that irrigation was responsible for 90 per cent of the consumption of global fresh water resources in the 20th century, but represented only 40 per cent of global food production. An equation she says clearly doesn’t balance. But she has warned that ’s salinity levels are a significant limitation on the expansion of rain-fed agriculture under the current conditions. Dr Scanlon also says one of the most effective ways of saving water is for consumers to eat less meat and more vegetables and cereals – producing one kilogram of bovine meat takes around 13,500 litres of water, the same quantity of vegetables takes around 150 litres of water, while a kilo of cereal uses around 1000 litres of water. “Rather than taking shorter showers, we all could save much more water by switching from meat to a vegetable- and cereal-based diet,” Dr Scanlon says. Dr Scanlon staged lectures in Perth, Adelaide, Melbourne, Canberra and Sydney while she was in Ausrealia, all of which were well attended by audiences with diverse industry and government backgrounds. 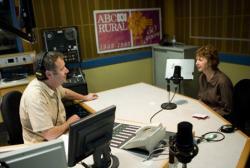 Dr Scanlon also attracted considerable media attention, with radio interviews in Sydney, Adelaide, Canberra and across the ABC’s regional radio network. Download Dr Scanlon’s presentation here.